← Wow, has it been over a month?? Some of you may remember that we’ve been having some ongoing issues with keeping our cat Bug in the house when it’s summer and the sliding glass doors are open. 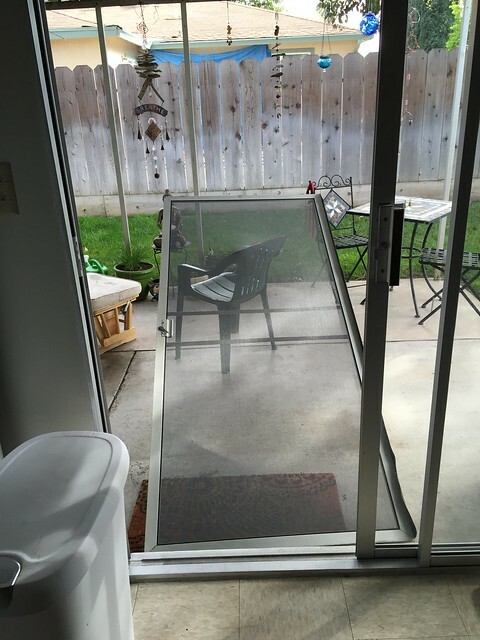 When we moved in to Spacious Green Acres, we made sure that we had a screen door that latched very securely, so that the cat could not get out or slide it open. I’m happy to report that the door totally works. The cat can not, in fact, slide the door open. This entry was posted in cats and tagged cats, cats are jerks, cats will destroy everything you love. Bookmark the permalink. 4 Responses to The saga continues. Smiling! When there is a will, there is a way. Yes, my cat has figured out the sliding, but hope your cat doesn’t teach him bad habits. We have to keep the screen latched in the summer. yeah, this one was latched. I figured out that the door itself is not really very good, we have to adjust it or get a new one. Hope your kitty doesn’t figure out how to work locks! (Laughing hysterically.). Yep, sounds like a cat, all right. Bad kitty!